Hey everyone! I am new to theGSP breed and could use sombre help. I always had setters and they were outside dogs but now have a gsp and she's inside. She's pretty good in the house most times. She's 14 weeks old now. She is crated during the day unless we're home. Then exercise and training in the evening and more chill time. Mostly obedience on the training end now and retreiving. So far she is good on recall, sit and down. Just mainly looking for some pointers on the house. Any help would be appreciated. Not used to heaving a dog in the house either and definitely not a high energy one. Where's the off switch? We have a female GSP in the house and wouldn't trade her for anything. But first year was pretty rough as far as learning manners in the house. She is 3 now and does a lot better nut does get excited when we have company over. Three short 5-minute mostly positive obedience sessions per day will -- over time-- yield an infinitely better house dog and mentally somewhat tire your dog out. You have a firecracker, and you need to put in daily work. Find an obedience club or school where the instructors have put meaningful titles on dogs-- CDX, UD, UDX or OTCH -- and go there. Don't go to Petsmart or a "force-free" halfwit. Get real training instruction. Train every day, several sessions. You can't expect much from a pup quickly, but you can over time. This will NOT replace appropriate exercise at this stage, but if you're going to have a house dog, you should have a civilized one instead of one you need to put away when company comes. Weekly classes will also help to socialize. Thank you all for the tips. We have been working on obedience at the house like sit, lay down and place. She's doing pretty good so far. I have an 8 week obedience class with a local lady with akc agility titles. It starts on the 27th. Really enjoy having her in the house with us as a family. I've spoke with some on Facebook groups and I haven't found many that helpful. Most seem to let their dogs do what they want. She is getting better everyday she just has those couple spurts of energy in the evening. The crate has helped the crazy times. She gets her deer antler and chews away. Then 5-10 minutes later she's pretty good again. Thank you all. I could see where she could be a real pain without obedience. Especially in the house. As far as the field she can't do any wrong. Just running and being a pup. She will be 16 weeks this Friday. 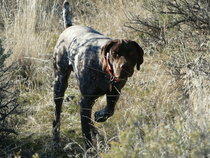 Gundog0181 wrote: Thank you all for the tips. We have been working on obedience at the house like sit, lay down and place. She's doing pretty good so far. I have an 8 week obedience class with a local lady with akc agility titles. It starts on the 27th. I could see where she could be a real pain without obedience. Especially in the house. Agility is fun for the dogs, but is NOT obedience work. Agility dogs are very poorly trained with no impulse control, though a few dogs and handlers do compete in both.While she may say she'll conduct obedience classes, ask her (or yourself) how effective an obedience competitor would be at training new dogs for agility. Good chance the lady trains at a facility that is double-use, in which case they'll have obedience classes. If not, ask for referrals. Agility does not make a better dog. And don't let the dog get on the furniture or ever go out the front door without a sit and then a clear release command (not "ok"). It's just as easy to train them right. As of now she's not allowed on the couch. But later on she will be. I'd prefer she didn't do it on her own and ask to instead. I don't see any problem it at all. Socializing counts for a LOT, and what you can't do easily at home is provide distractions. That's a major benefit to weekly classes. Of course she's a pup, but expect her to not respond too well in class. Eventually, she'll work for you regardless of distraction, but it will take daily training and then increasing diversions under various circumstances. You will get results --though slowly at first-- and many of us think it's very interesting and a lot of fun. It will greatly expand the number of places you can take your dog and your communication with her. My younger wirehair is a UD (older one FC MH, just so you don't think I'm a pure obedience guy) and pet people think he's a magic dog. He sure wasn't when we started! Obedience training is important and will pay dividends in the future. But, remember a well trained dog isn't the same as a well-behaved or dog, or a dog that's a pleasant house companion. Your dog will need plenty of exercise for the latter. Unstructured nature walks, walks on a leash, play time at the park, chasing a tennis ball or pointing squirrels or whatever, probably 45 minutes a day. It isn't fair to expect a dog that's been crated all day to be instantly calm and chill out on his bed. I foster for GSP rescue, and I see a fair few dogs that are surrendered because people think they can get away with a fifteen minute walk around the block on a leash for activity. Not the case. Take your dog to different places. Fairs and festivals, the kid's soccer games, field trials, whatever, so that your dog becomes mentally well adjusted and doesn't turn into a headcase as soon as its brought out of its comfort zone. Especially now while he's a puppy and everyone wants to handle him. Yes I'm looking forward to it. The teacher has allot of titles on her dogs including ud and hd titles. She has a couple collies. So I think as far as training obedience she should be great! Thanks for the help, I didn't know about the titles and stitch prior to this post. I now have more faith and interest in attending and that it will improve our relationship in the home.